← Should Salisbury City Be Reinstated? Preseason is well and truly upon us now, and this weekend I was able to take in two games on the same day. Heaven! The beauty of preseason tournaments is that they always have an early match, and thankfully the football gods (or rather the tournament organisers) had deigned to allocate the morning slot to Hampton’s first preseason match. That meant I could embark on a two game mini groundhop, starting out with the near thirty mile trip from our Berkshire home to Corinthian Casuals’ King George’s Field for the first game, before then heading off to Wokingham to see Bracknell Town play Uxbridge. It seems a long time now since the season ended, so waking up on a Saturday morning with football on the agenda was a good feeling. An eleven o’clock kickoff thirty miles away down the M3, M25 and A3 didn’t, however, fill me with the same warm feelings! Add to that the trepidation of being accompanied not only by my regular football companion – my five year old son – but also my three month old daughter for the first time, and it promised to be an interesting venture! Thanks to the wonders of modern technology, my satellite navigation system decided to take me to the wrong side of the park, meaning by the time we’d managed to actually find the ground ten minutes had already elapsed. During this time, I’m reliably informed that Merstham hit the post from a second minute free kick. And it was the Step Four club that looked the more impressive for much of the first half, forcing a good save from Hampton keeper Milan Stojsavlejevic before a 25 yarder crashed off the crossbar. Hampton started to move the ball better as the first half wore on, with Hassan Ibrahim making a good tackle before feeding the ball to Jack Barton. The winger’s perfect lobbed pass was controlled well by last season’s top scorer and player of the season Charlie Moone, but his half volley was well saved by Merstham stopper Brannon Daly. Richard Butler, the former AFC Wimbledon and Staines Town striker, also had a powerful effort saved. Merstham took the lead seconds before the half time whistle when Fabio Saraiva’s cross-shot seemed to deflect into the net. The second half pretty much died among the heat and usual raft of substitutions, with the only notable efforts seeing Daly deny Butler and Moone. It wasn’t until the 83rd minute before we had another goal. Substitute George Gould slipped Butler in, and he clipped a lovely finish over Daly to level. It looked as though the match might go to penalties, but Saraiva was able to make sure that didn’t happen, firing in from an acute angle to secure victory for the Ryman Division One South team over Premier Division opposition. It was then back into the car for the thirty-odd mile trip back down the A3, M25 and M3 to get to Wokingham in time for the second match! 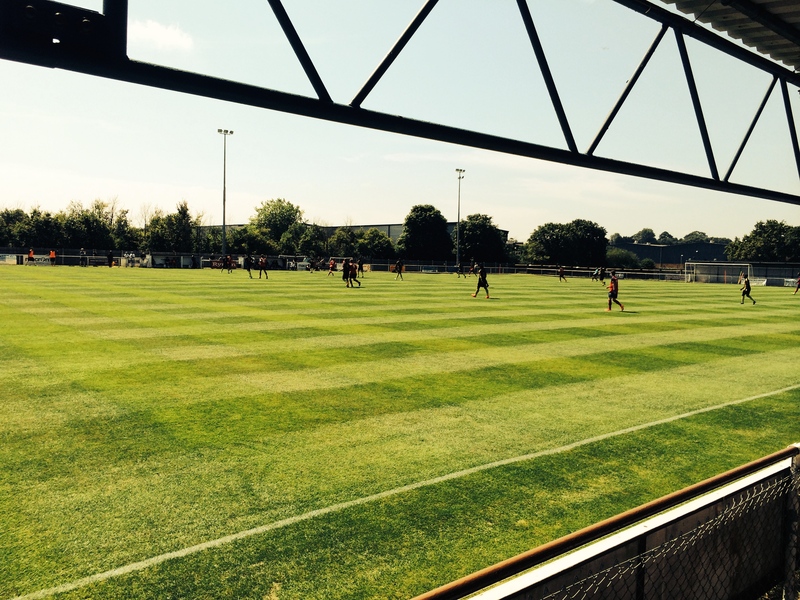 Game 2 – Bracknell Town v Uxbridge. Cantley Park, Wokingham. Kickoff 3pm. Distance from Game 1 to Game 2: 34.1 miles. Whereas the first match cost eight pounds to get in and a further two pounds for the programme, this one was played in a park, and therefore entry fees and programmes were non-existent, as was a teamsheet (although I did recognise a few of the players from last season). 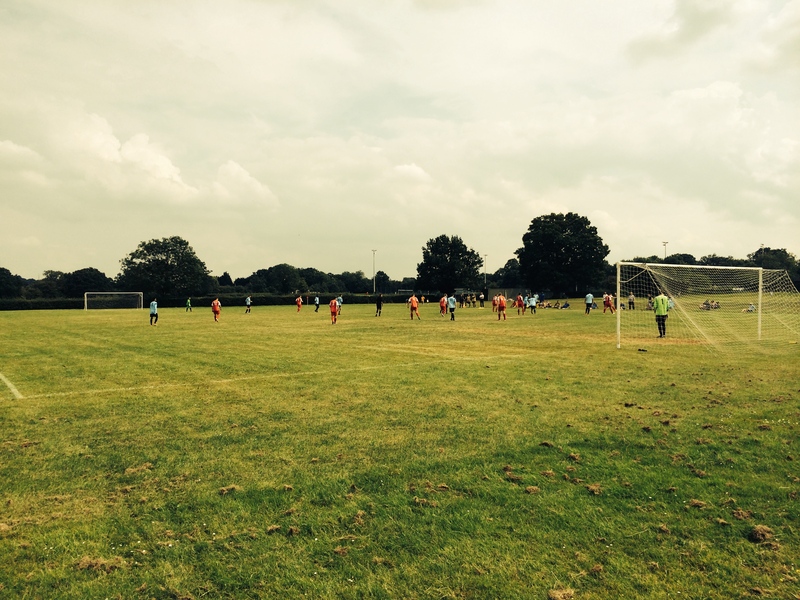 This match pitted Step 5 Bracknell against Uxbridge from the level above, but the lower ranked Robins put on a fantastic display in sweltering conditions. Uxbridge were the first to threaten, with a shot clipping the outside of the post, before their number three cut in from the left and fired narrowly wide. It wasn’t until just before the half hour mark that Bracknell had a clear chance, when the number seven caught a defender in possession but shot wide when clean through. Uxbridge took a lead into half time following a good finish, but Bracknell levelled four minutes into the second half, Luke Angel netting an overhead kick into the bottom corner. 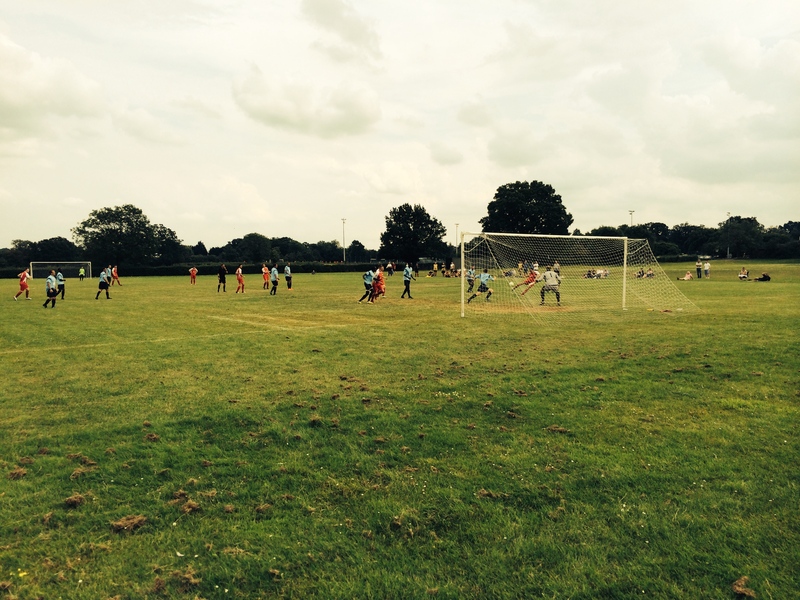 Both teams had goals correctly chalked off for offside, but were both going all out for the win in the blazing sun. Shane Cooper-Clark – so vital to this Bracknell side – flicked a long ball on to substitute Jake White, but his shot was saved. Bracknell keeper Dan Smith made two good saves; first keeping out a header from a corner before a good save from a direct freekick. Jake White and Cooper-Clark continued to combine well, with the latter controlling a long ball before a backheel nutmeg on his marker put White in the clear. However, the Uxbridge keeper was again on hand to repel the shot. With five minutes remaining, White’s shot was tipped wide, but from the corner Harry Brown scrambled home the winning goal. A great win for The Robins against higher level opponents, one that should fill them with plenty of confidence going forward. All that remained for us was to make the much shorter, six mile journey back home. Full time: Bracknell Town 2 Uxbridge 1. Total mileage to see two games and six goals: 69.5 miles. 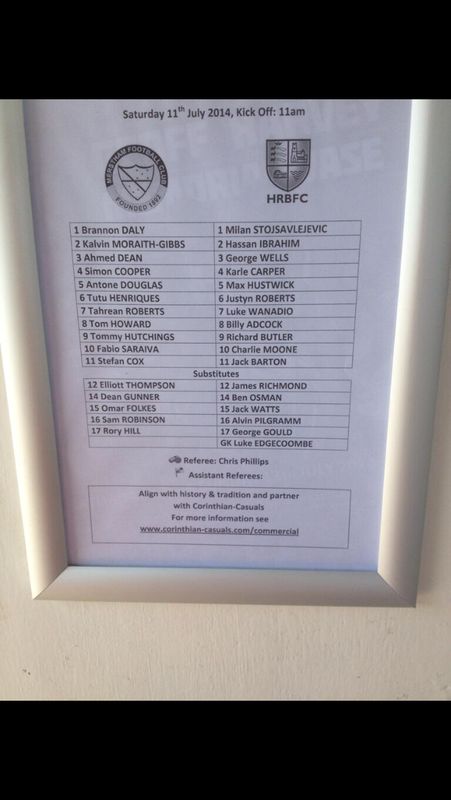 Posted on July 13, 2014, in UTL Archive and tagged Bracknell Town FC, Charlie Moone, Hampton & Richmond Borough, Harry Brown, Jake White, Merstham FC, Shane Cooper-Clark, Uxbridge FC. Bookmark the permalink. Leave a comment.